This month, Maddie’s Fund is commencing a three-year effort to make Nevada a state where all healthy and treatable animals are saved. The effort is called Maddie’s Pet Project in Nevada (MPP-NV), and it is jointly funded by Maddie’s Fund and the Dave and Cheryl Duffield Foundation. MPP-NV will be officially kicked off by Nevada governor Brian Sandoval on April 26th at an event in Reno. The kickoff will be followed by a statewide Maddie’s Pet Adoption Days event on April 27 and 28. Every incorporated animal-welfare group in the state is invited to participate in the adoption event. When Maddie’s decided to do the MPP-NV campaign, they called in the Humane Network consulting service. The Humane Network team for MPP-NV is led by Bonney Brown, Diane Blankenburg, and Mark Robison. I recently interviewed Brown about MPP-NV – its goals, the challenges it faces, and the plans for creating a statewide safety net for pets. Humane Network did an in-depth feasibility study for MPP-NV which looked at shelters in the state but also went beyond the shelter walls to look at how pets are doing in communities that don’t have shelters. The study used interviews, surveys, and other data-gathering methods. We rarely get this type of demographic data on pets in individual communities, let alone entire states. A survey that was part of the feasibility study showed that Nevadans have strongly positive attitudes about pets. 93% of Nevadans have owned a pet, 88% feel it is appropriate to grieve the death of a pet, and 86% think the well-being of dogs and cats is important. Similar percentages of Nevadans have positive attitudes toward homeless pets — 91% reported that the fate of dogs and cats in shelters mattered to them, 90% would help a stray animal, 76% indicated that they would be interested in volunteering to help cats and dogs in their community, and 66% said that they would obtain a new pet from a shelter or rescue group. There were no significant differences in attitudes between urban and rural residents or between average and low-income people. A lack of communication among shelters in the state, which leads to missed opportunities for shelters to help each other. One example is that some shelters have built up more demand for adoption than they have animals, while animals are dying in other shelters due to time or space limitations. Some shelters have so few resources that they struggle just to complete basic tasks, and are not able to focus on networking or developing programs. In almost every community, large mixed-breed dogs, Chihuahuas, and community cats need help. Kittens and puppies who are too young for adoption are also at risk. These groups make up a disproportionate percentage of animals who die in shelters or are left on their own in areas that do not have animal services. Rural areas, Native American reservations, and low-income urban areas often lack low-cost veterinary services. Animals are dying of easily preventable and treatable illnesses. These areas tend to have few or no veterinary clinics, and residents often have transportation difficulties and lack money to pay for veterinary care. 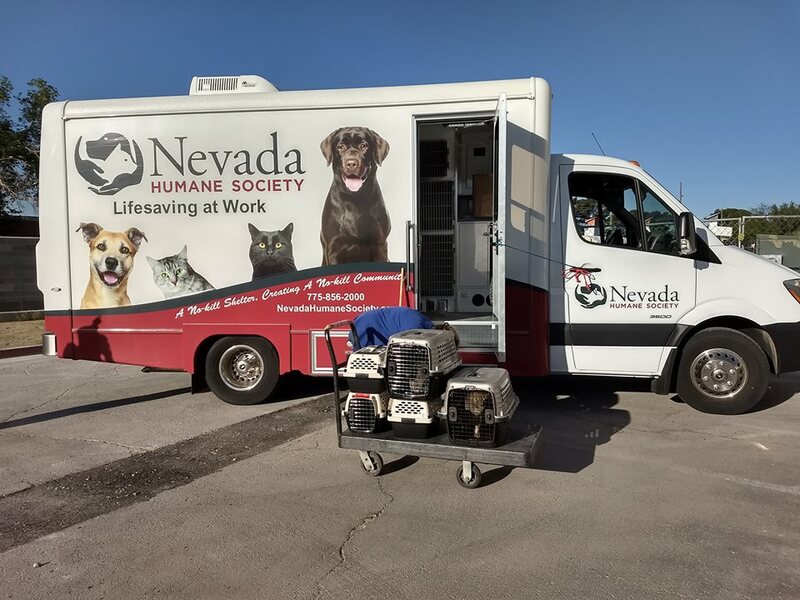 Nevada has few low-income spay-neuter services, and spay-neuter and vaccination services are unavailable in many rural areas. A data analysis of Nevada shelter save rates found that in most shelters the save rate for dogs is substantially higher than the save rate for cats. This data analysis allowed Humane Network to identify counties that have high numbers of animals dying in shelters and propose ways to bring down those numbers. The Nevada Humane Society (NHS) in Washoe County is a linchpin of the MPP-NV plan. Washoe County, located along the western border of the state, is home to the cities of Reno and Sparks. It has a very high shelter save rate resulting from the partnership of NHS and Washoe County Regional Animal Services (WCRAS). As with many such partnerships, the private shelter (NHS) pulls unclaimed animals from the public shelter (WCRAS) once their hold periods are up and finds homes for them. The partnership between NHS and WCRAS dates back to 2006. In recent years NHS has partnered with nearby Carson City, which is now saving a very high percentage of its shelter animals. Reno is also the home of the SPCA of Northern Nevada, which has grown into an important organization. Humane Network has a close connection with NHS, since Brown is a former executive director of NHS and led its successful community lifesaving campaign. A high priority for Brown when she became director of NHS in 2007 was to make adoption from a shelter the first thing people thought of when they wanted to acquire a pet. Brown and Blankenburg, who was also an executive at NHS at the time, used marketing to achieve this goal, and subsequent NHS leaders have kept up the marketing effort. The “culture of adoption” in Washoe County can be seen when comparing its high rate of adoption to other counties in Nevada. This phenomenon is so important that I’m going to talk about it in detail in a follow-up blog. One of the results of the high adoption rate in Washoe County is that NHS has a shortage of animals for adoption, and can help other shelters in the state by taking in some of their at-risk animals. The Reno area has a substantial population, but the Las Vegas area, which is in the far southern tip of the state, is far bigger. Clark County, home of Las Vegas, has 75% of the state’s population. A shelter reform effort has been underway in Las Vegas in the last few years, and the shelter system has been making good progress. MPP-NV wants to help that effort reach its 90%+ save-rate goal. One method of helping is to transport animals from Clark County to Washoe County. 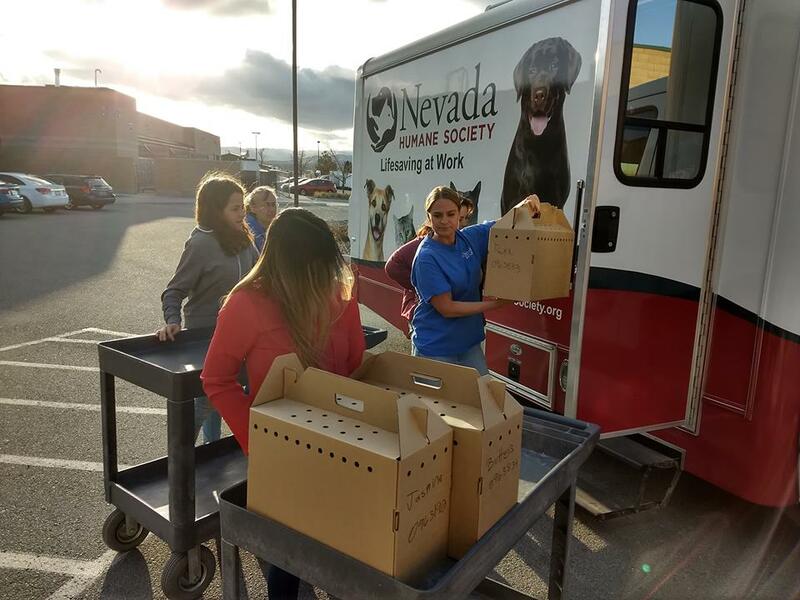 MPP-NV funded its first transport of 49 cats and 6 rabbits from the Animal Foundation in Las Vegas to NHS in Reno on April 10-12. These were animals with medical or behavior issues that made them difficult to place in Clark County. The MPP-NV feasibility study showed that veterinary clinics, shelters, and nonprofit animal organizations are heavily concentrated in and around Reno, Carson City, and Las Vegas. 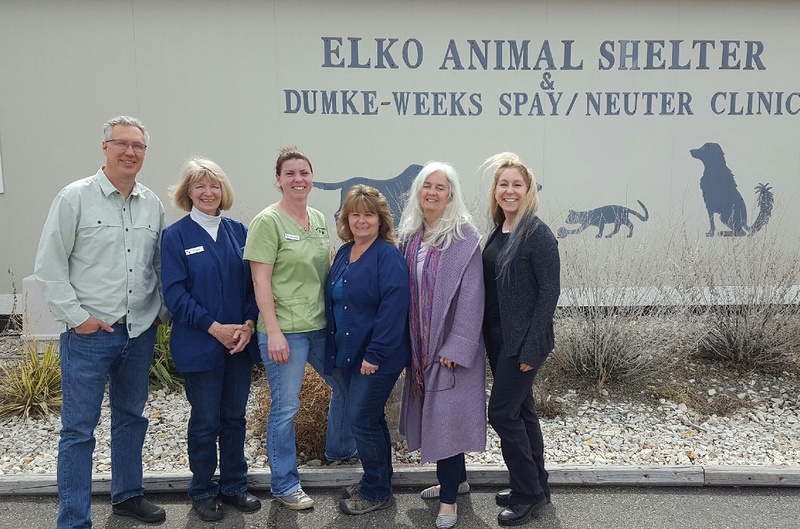 A handful of animal organizations are also located in small communities that have grown up along the I-80 corridor, which runs from Reno across the north-central part of Nevada. MPP-NV will start out its lifesaving efforts by strengthening the safety nets for pets in two areas of the state – Clark County and the I-80 corridor from Washoe County to Elko County on the eastern border of Nevada. 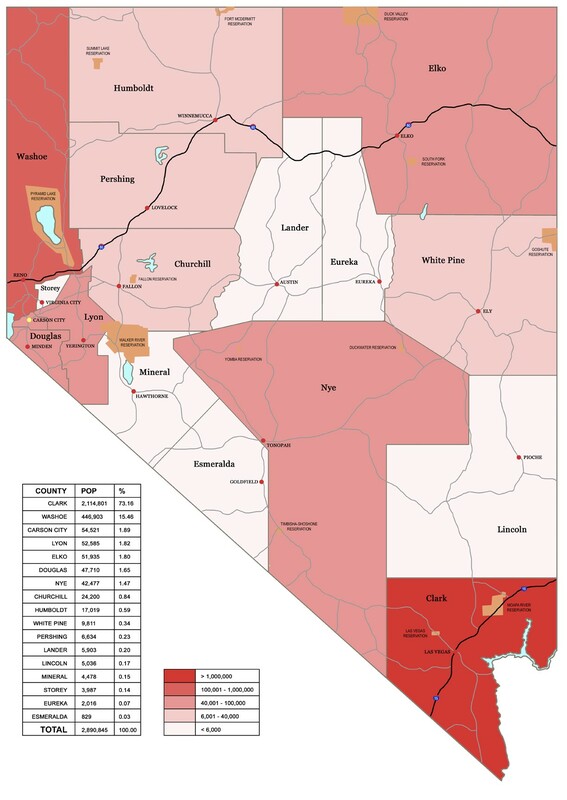 These areas contain a high percentage of Nevada’s human population. Humane Network is conducting listening tours in the areas they have identified as starting points for MPP-NV. In Washoe County they met with county officials, veterinarians, and tribal governments and asked for their views on how lifesaving could be improved. They visited all the major shelters and spay-neuter clinics in Clark County. The most recent listening tour was conducted on the I-80 corridor. 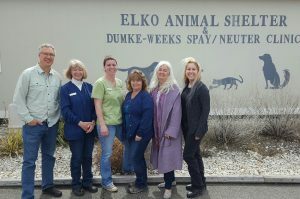 The photo shows the Humane Network team with staff from the Elko Animal Shelter. By starting its work in the parts of the state that have existing infrastructure for lifesaving, MPP-NV will be able to first strengthen that existing infrastructure and then reach out into the underserved rural areas. In 2015, two of the 17 counties in Nevada had no animal shelter and several had no private veterinary clinic and no identifiable rescues. Only Clark and Washoe counties and Carson City have non-profit veterinary clinics. The state has few TNR clinics. The remote rural areas in the state are not only lacking in infrastructure for saving homeless pets, they also have few services for owned pets. Everything must be built from the ground up. Because creating an entire lifesaving infrastructure from scratch is a new type of endeavor, Brown does not have a roadmap for it. She believes, however, that grassroots organizing will be one key to developing a safety net for pets in sparsely populated areas. She has experience with that kind of organizing going back to her work on TNR in Massachusetts in the early 1990s, when she founded a humane society that spearheaded TNR efforts in several towns. She found that grassroots organizing helps local people form their own sustainable institutions. Grassroots organizing in rural communities could begin with the development of foster networks and the use of marketing to develop a culture of adoption. 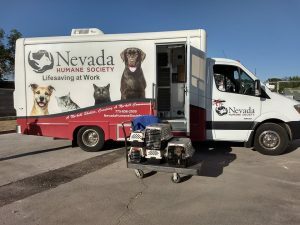 Transport of animals to Washoe County could be used to jump-start lifesaving, but creating a culture of adoption will allow communities to place their animals locally, which is the ultimate goal. Many of the remote rural communities in Nevada cannot economically support a private-practice veterinary clinic. In those cases, a mix of for-profit and non-profit organizations may need to work together to create solutions. NHS and the SPCA of Northern Nevada have mobile vans for transport and spay-neuter. It might be possible to work out arrangements for private veterinarians to use those vehicles and donate their time. Given the need for creating infrastructure, MPP-NV is developing a strong leadership-building component. That component will help recognize and develop grassroots leaders, but also train leaders who are already in the field. In conjunction with that effort, MPP-NV has provided 18 scholarships to attend HSUS EXPO. An exciting component of the leadership effort is that Maddie’s will be hosting two conferences each year, one in Reno and one in Las Vegas. The conferences are called Saving Nevada’s Pets and are free for leaders and managers of Nevada humane organizations. The Las Vegas conference will be held on June 5, and the Reno conference is scheduled for October 25. The hope is that the conferences will help not only with training, but also with networking. Brown feels that networking opportunities are important because rescuers and shelter staff are often so busy with the work they face every day that networking can fall by the wayside. The Nevada effort will be data-driven, and the plan is to repeat the surveys and data collection at the end of the three-year program to measure progress. The project’s founders envision that, by developing sustainable grassroots organizations and networks, the good effects of the project will carry on in Nevada long after it ends. MPP-NV may also have an exemplary effect outside Nevada, especially in western states that have many communities that are lacking in lifesaving infrastructure.